A bird also catches a cold. This is a common thing that happens mostly on baby birds. Baby birds are weak and their feathers are not fully developed, so when they can get a cold easily! When birds get a cold, they often tuck their heads under wings with fluffed feathers, appear no appetite, inactive and sleepy. Finally they die if you don’t treat them in time and correctly. Here’s my experience to treat a bird’s cold effectively and simply. Use garlic! 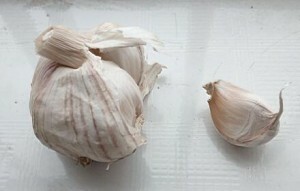 Garlic can kill the Cold bacteria. Firstly, we can cut the garlic into small piece and put them into water to have garlic water, drip feed the bird with garlic water. 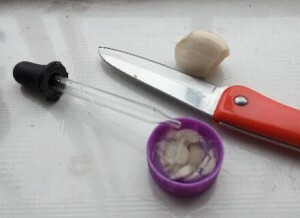 The second way is to mix the garlic pieces into the soft food to feed your bird. In general, the garlic water will take effect quicker. Two or three hours after being fed with the garlic water, the bird will become spirited again! Continuously feed the bird 3 days with garlic water and/or garlic pieces to achieve a complete recovery. After feeding with garlic and letting it rests 2~3 hours, bask the bird in the sun for 5-10 minutes, you would observe the bird tighten its feathers and becomes more active. Be careful not to put the bird in the sun too long otherwise you are killing it. Some points need to be noted for this issue. Don’t bathe your baby bird just because you consider it very dirty. Most of the baby birds get cold just because their owners bathe them. 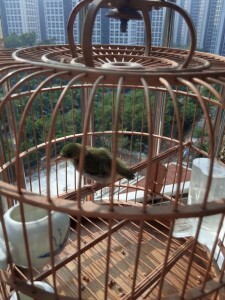 The idea of bathing the bird with warm water and blow it to be dry with warm wind by dryer is wrong! The bird still easily to get cold by such a way! You can use a moisty cloth to scrub gently the surface of the feathers and let the bird wash itself when it grows up. When your bird get a cold, don’t try the antibiotics easily, the antibiotics may not cure the bird’s cold and would cause serious side effects that kill your bird.